The U.S. Two Cent coin first appeared in 1864, during a stretch of coin shortages brought on by the Civil War. It was the first U.S. coin to bear the motto "IN GOD WE TRUST", an expression of faith in the Almighty to guide the nation through those perilous times. Other significant aspects of the Two Cent coin is that it was made of 95% copper, plus tin and zinc (i.e. bronze), and intentionally underweighted in relation to its face value. Along with the bronze Indian Head Cent of 1864, the public readily accepted the idea of underweight coppers as pocket change, which alleviated the coin shortage. Although underweight coinage proved to be a workable concept, the Two Cent coin itself never gained traction with the people and was discontinued in 1873. The 1864 Small Motto Two Cent Coin not only has significant historical connotations, it ranks highly with coin collectors (partly because of those historical connotations). The blue line above graphs the percent change in value of this coin in F-12 condition since Year 2000. 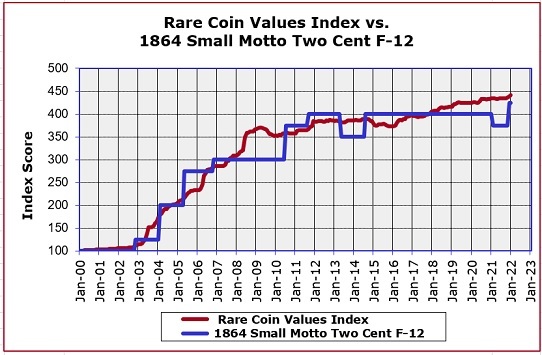 The red line tracks the progress our Rare Coin Values Index, which computes the percent change over the same time period of a pre-selected group of 87 rare US coins, of which the 1864 Small Motto Two Cent coin is a member. Both start at a baseline of 100. As you can see, the 1864 Small Motto Two Cent coin tracks the overall Index score closely. The Index is updated monthly.